In Tibetan Buddhism, the successive Dalai Lamas (taa-la’i bla-ma) form a tulku lineage of Gelugpa leaders which trace back to 1391. Tibetan Buddhists believe the Dalai Lama to be the present incarnation of Avalokitesvara («Chenrezig» in Tibetan), the bodhisattva of compassion. Between the 17th century and 1959, the Dalai Lama was the head of the Tibetan government, controlling a large portion of the country from the capital Lhasa. The Dalai Lamas never had authority over every region of Tibet nor over the other sects of Tibetan Buddhism. The current Dalai Lama (the 14th) is a respected Tibetan Buddhist religious leader and figurehead of the International Tibet Independence Movement; in English, he is often granted the style «His Holiness» (or HH) before his title. The Dalai Lama is often thought to be the head of the Gelug school, but this position officially belongs to the Ganden Tripa (dga’ ldan khri pa) (Holder of the Throne of Ganden , the first monastery established by Tsongkhapa , founder of the Gelug). The 5th Dalai Lama, with the support of Gushri Khan, a Mongol ruler of Khökh Nuur, united Tibet by force. The Dalai Lamas continued to rule in Tibet until the People’s Republic of China took direct control of the region in 1959. The 14th Dalai Lama then fled to India and has since maintained a government in exile. See History of Tibet for further information. «Dalai» means «ocean» in Mongolian, and «Lama» (bla ma) is the Tibetan equivalent of the Sanskrit word «guru», and so may mean «teacher» or «monk.» The actual title «Dalai Lama» is best translated as «Ocean of Wisdom»; it was first bestowed by the Mongolian ruler Altan Khan upon Sonam Gyatso, an abbot at the Drepung monastery who was widely considered the most eminent lama of his time. Although Sonam Gyatso became the first lama to hold the title «Dalai Lama», due to the fact that he was the third member of his lineage, he became known as the «3rd Dalai Lama». The previous two titles were conferred posthumously upon his earlier incarnations. The title «Dalai Lama» is presently granted to each of the spiritual leader’s sucessive incarnations (for example, The 14th Dalai Lama’s next incarnation will hold the title «the 15th Dalai Lama»). Tibetans call the Dalai Lama Gyawa Rinpoche (rgya ba rin po che) meaning «Precious Victor,» or Yeshe Norbu (ye shes nor bu) meaning «Wisdom Jewel». The 14th Dalai Lama, as well as each of his predecessors, are considered to be the incarnations of the Buddha of Compassion. Upon the death of the Dalai Lama, his monks institute a search for the Lama’s reincarnation, or tulku (sprul sku), a small child. Familiarity with the possessions of the previous Dalai Lama is considered the main sign of the reincarnation. The search for the reincarnation typically requires a few years, which results in a gap in the list of the Dalai Lamas. The reincarnation is then brought to Lhasa to be trained by the other Lamas. Despite its officially secular stance, the government of the People’s Republic of China has claimed the power to approve the naming of high reincarnations in Tibet. This decision cites a precedent set by the Qianlong Emperor of the Qing Dynasty, who instituted a system of selecting the Dalai Lama and the Panchen Lama by means of a lottery which utilised a golden urn with names wrapped in barley balls. Recently, this precedent was called upon to name the Panchen Lama, who is empowered to recognize the new Dalai Lama. There is some speculation that with the death of the current Dalai Lama, the PRC will direct the selection of a successor. 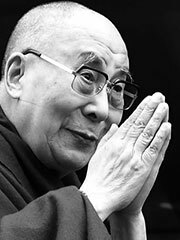 The current Dalai Lama has repeatedly stated that he will never be reborn inside territory controlled by the People’s Republic of China , and has occasionally suggested that he might choose to be the last Dalai Lama by not being reborn at all. However, he has also stated that the purpose of his repeated incarnations is to continue unfinished work and, as such, if the situation in Tibet remains unchanged, it is very likely that he will be reborn to finish his work . Additionally, in the draft constitution of future Tibet, the institution of the Dalai Lama can be revoked at any time by a democratic majority vote of two-thirds of the Assembly. It is also worth mentioning that the 14th Dalai Lama has stated «Personally, I feel the institution of the Dalai Lama has served its purpose.». Starting with the 5th Dalai Lama, until the 14th Dalai Lama’s exile in 1959, the Dalai Lamas resided in Lhasa in the Potala Palace during winter and in the Norbulingka residence during summer. Since 1959, the Dalai Lama has resided in Dharamsala in Northern India, and the Tibetan Government in Exile has its headquarters there.